1 The Spirit of the Sovereign Lord is upon me, for the Lord has anointed me to bring good news to the poor. He has sent me to comfort the brokenhearted and to proclaim that captives will be released and prisoners will be freed. 2 He has sent me to tell those who mourn that the time of the Lord’s favor has come, and with it, the day of God’s anger against their enemies. As the time came for him to leave, Jesus had gathered faithful men from all walks of life and it was finals week, crunch time, feet to the fire time. He knew his time was short, that the end was fast approaching. He had said all he could say. His teaching had offered a great hope, that this life is not the end. The way it should have been before sin entered this world and set humans at odds with their Heavenly Father where the choice instead of what is best became what is best for me. From this premise every war, every argument, every hurt would come. He had made enemies within the Jewish Leadership, and they were going to use all the power at their disposal to bring about his demise. He had left it all in the hands of a few disciples and his teachings would either take off after his death or die in the dust. As history has shown, those disciples with the help of God’s Holy Spirit did take those teachings and spread them far and wide. We now have proof that what Jesus started back 2000 plus years ago was truly a force to be reckoned with. It is the only religion that has a God coming down to man. A way was provided for reconciliation to be acquired and it isn’t all up to us and the power of our own will to earn our salvation. To be made right with God and be adopted into His family is a gift freely offered. We celebrate Easter not because of the death of a great man, but because that great man conquered death and rose from the dead on Resurrection Sunday! Wouldn’t this Easter be a great time to really take a deep look at this gift of eternal life and all that it entails? For those of us with faith to be more appreciative of it and be willing to share it and for those who are still seeking something to believe in. Jesus’ gift is still extended to all. Take this weekend to celebrate and acknowledge the great gift we’ve been given this Easter! By Pastor Rey Diaz Crowds in cities like Thessalonica, Philippi, or Corinth: Who is this odd little man, sounding as if he’s a royal herald making a proclamation about a new emperor? And who is this new emperor anyway? Paul: He is a Jew! And he was crucified! He is called Jesus! Crowd: At this point mouths drop open with incredulity. People stare. This guy is drunk. Or crazy. Crucifixion is about the most shameful thing that can happen to you. Besides if he was crucified it means he’s dead. How can a crucified man be the Lord, the Son of God? Paul: No! He’s alive! God raised him from the dead! Crowd: Now the crowd knows Paul is mad. Everybody knows perfectly well that dead people don’t come back to life. It’s the ultimate statistic. 100% of people will die. No one escapes. Paul: I have good news to share. The Messiah died for our sins in accordance to the Bible and he was raised on the third day! This was and continues to be shocking, scandalous and foolishness to the crowd. But Paul continues sharing this Easter message. There is after all one true God, the God of Israel. He made the whole world, and he planned an amazing rescue operation for that world. The news is that this rescue operation has happened! Jesus, who died and was raised, is Israel’s Messiah and when he returns he will be Lord of he whole world. You can see why the gospel was considered scandalous by most. But in essence Paul was just sharing good news; it is the news that something has happened and as a result the world is a different place. It wasn’t a new religion, moral system, or philosophy. One can debate the merits of a religion, moral system, or philosophy, but a news event is discussed in a different way. Either the event happened or it didn’t; if it did happen, either it means what people say it means, or it doesn’t. Paul was telling the people that Jesus death and resurrection had changed the world, that the world was now a different place, and that he was summoning them to be part of that new, different reality. This event would cause them to adjust their entire lives in order to come into line with the way things now were. When Roman heralds came into a city like Thessalonica announcing that a new emperor had been enthroned, the didn’t mean, “Here is a new sort of imperial experience, and you might like to see if it suits you.” They meant, “Tiberius (or any other emperor) is the Lord of the World. You are lucky recipients of this good news; he demands your loyalty, your allegiance, and of course you taxes.” That’s how Roman good news worked. Paul uses the word ‘herald” to talk about his own mission sharing the good news. He wasn’t offering people a new type of torch so they could see better in the dark. He was saying that the sun had risen, and that if you would only open the curtains you’d see that you don’t need torches anymore. “I believe in Christianity as I believe that the sun has risen: not only because I see it, but because by it I see everything else.” – C S Lewis. 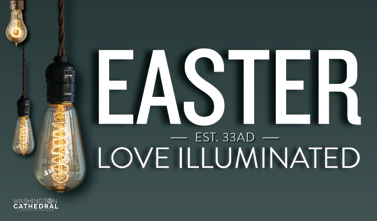 Easter is at the center of the gospel. The Messiah died, was buried, was raised, and was seen. Take that away and Christianity collapses. Put it in its proper place and the whole world is different. This good news about what has happened points to the good news about what is yet to happen. Death’s defeat. Eternal life. Resurrection. Heaven. That’s what Easter is about. Come celebrate with us this weekend! PS – I have borrowed heavily from a book by N.T. Wright “Simply Good News: Why the Gospel is News and What makes it Good” to write this little blog. And by ‘borrowed heavily’ I mean straight plagerism in some parts. I decided to read this book during holy week and have been so inspired. I highly, highly recommend it to everyone. Get it here: Simply Good News.